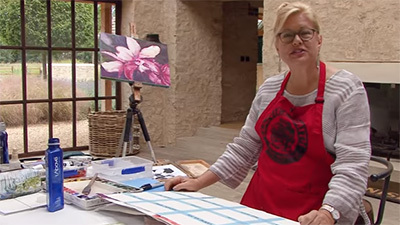 Painting in Cornwall, David illustrates his approach to watercolour. 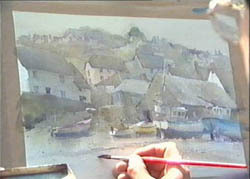 Boats in an estuary and the village of Cadgwith viewed from the beach are painted on site. 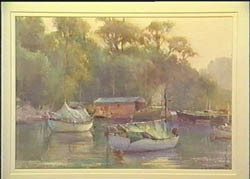 A further scene of a wooded bay with boats is painted in the studio, using an oil painting as source material. . 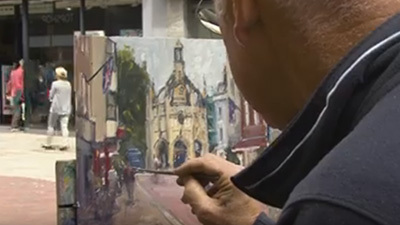 Following his successful film A Light Touch: Landscapes in Oils, David Curtis chooses the south coast of Cornwall as the setting for his latest video A Personal View: Landscapes in Watercolour. 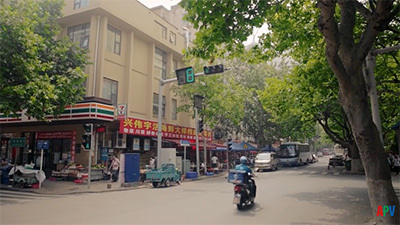 The area offers an abundance of stimulating subjects from which Curtis selects three varying scenes. 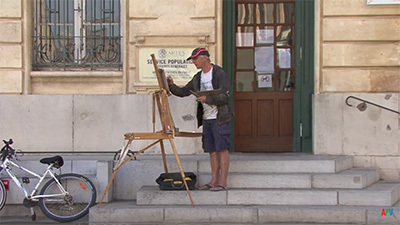 Two of these he approaches in a loose and spontaneous manner, working plein air, whilst the third is completed back in the studio, based on an oil sketch. The first painting depicts a group of boats in the estuary at Gweek; a composition carefully selected to provide an interesting balance of solid masses that lead through the picture space, and strong directional lines in the rigging. On stretched paper with the drawing already in place, he freely washes in colour over the entire painting area, safe in the knowledge that pre-applied masking fluid will retain necessary highlights. Once touch dry, and with the masking fluid removed, he adds detail, initially fairly broadly, and then with finer definition. 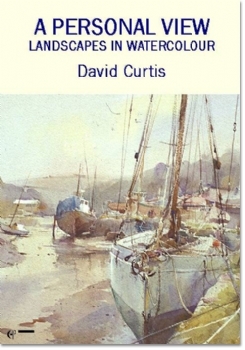 For his second study Curtis moves to the fishing village of Cadgwith where he paints the harbour from the beach. This time he begins working wet-into-wet, again over a sound drawing and masked highlights. As so often happens, he is faced with the challenge of coping with a gradual change from flat light to full sunshine, so opts for a diffused effect midway between the two. His final piece, worked back home in his studio, is a quiet wooded bay in Penryn. Reinterpreting an oil sketch, Curtis takes a more considered approach which still achieves the vitality of a painting completed on site. Such freshness is the result of his lack of complacency, and inherent anxiety, common to virtually all artists, in the potential mutability of his talents. 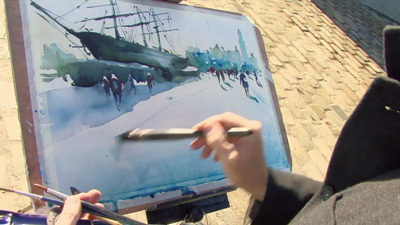 Nonetheless, throughout the film, his self- assured handling of the brush and the apparent ease with which the soft yet rich medley of colours combine to produce such stunning results, make it hard to us lesser mortals to believe his claim that he is totally shattered by the end of a day's painting! 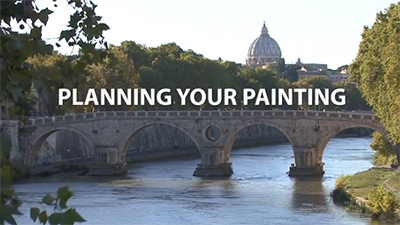 He doesn't instruct as he paints, but we learn a considerable amount as we watch and listen to him, as he works and talks unassumingly through his methods. His demonstrations are certainly inspiring and one can only look forward to the publication, in April 1996, of his book on the same subject. A Personal View: Landscapes in Watercolour by David Curtis. This extremely interesting and excellently shot film reveals David's 'ghost effect' method for setting the scene and subsequently how he works back into these initial weak washes to build up the picture and develop its impact. 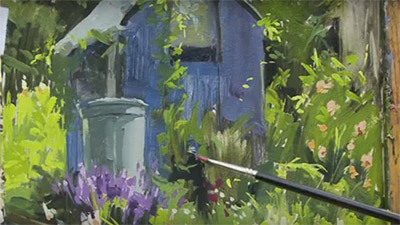 David places emphasis on sound composition and the strength of the initial drawing and, as with John Yardley, we are privileged to watch a real master at work - and there is a lot to learn!